I had an opportunity over the rainy weekend to work on some cards. Gotta love those rainy days for indoor activities.....makes for a great excuse to put in some crafting time. Rain, rain and more rain.....what better time than to make a card with a rainy theme and then combine it with a get well theme to make a great themed card for someone special who just gone through with a major back surgery. Ouch! Even just saying or writing it makes it sound painful. Yikes! I cannot even imagine what its like to go through that type of surgery. God bless those that have gone through that. I love the La La Land Crafts! I am addicted to those cute stamps. 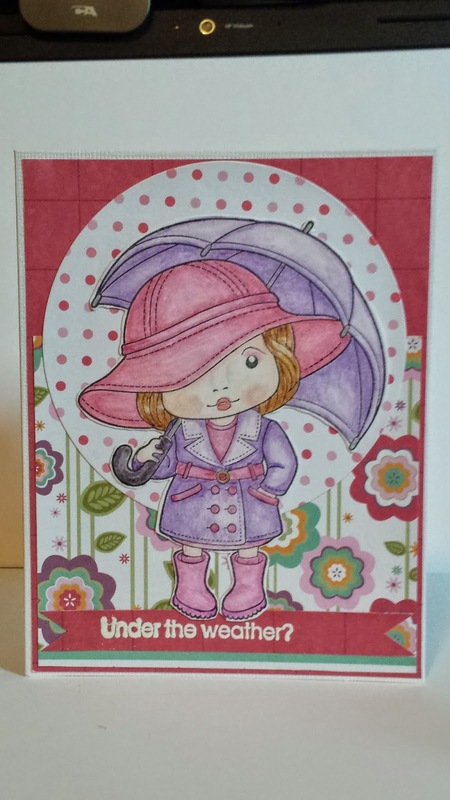 I chose to use Marci With Umbrella stamp and colored it with colored pencils. Some areas were blended with some odorless mineral. I had found some pretty in pink polka dotted design paper that I thought might make a cute colored rainy affect for this card. 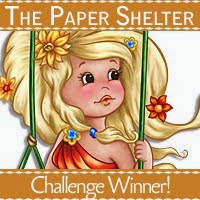 I thought the flowered design paper might make it look like she is in a flower garden. Well that is what my thoughts were as I was planning it out in my mind. Lol. I put it together on a plain white cardstock. Sentiment has been white embossed. Sentiment is also from La La Land Crafts and came with the Marci with Umbrella stamp. Thanks for stopping in for a viewing. I hope you enjoyed it. I hope you have a happy scrappy day!